From the perspective we get on Earth, our planet appears to be big and sturdy with an endless ocean of air. 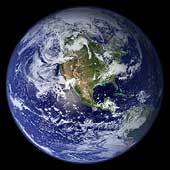 From space, astronauts often get the impression that the Earth is small with a thin, fragile layer of atmosphere. 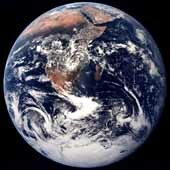 For a space traveler, the distinguishing Earth features are the blue waters, brown and green land masses and white clouds set against a black background. 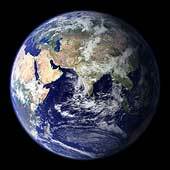 Earth is the 3rd planet from the Sun at a distance of about 150 million kilometers (93.2 million miles). It takes 365.256 days for the Earth to travel around the Sun and 23.9345 hours for the Earth rotate a complete revolution. It has a diameter of 12,756 kilometers (7,973 miles), only a few hundred kilometers larger than that of Venus. Our atmosphere is composed of 78 percent nitrogen, 21 percent oxygen and 1 percent other constituents. Earth is the only planet in the solar system known to harbor life. Our planet's rapid spin and molten nickel-iron core give rise to an extensive magnetic field, which, along with the atmosphere, shields us from nearly all of the harmful radiation coming from the Sun and other stars. Earth's atmosphere protects us from meteors, most of which burn up before they can strike the surface. From our journeys into space, we have learned much about our home planet. The first American satellite, Explorer 1, discovered an intense radiation zone, now called the Van Allen radiation belts. This layer is formed from rapidly moving charged particles that are trapped by the Earth's magnetic field in a doughnut-shaped region surrounding the equator. Other findings from satellites show that our planet's magnetic field is distorted into a tear-drop shape by the solar wind. We also now know that our wispy upper atmosphere, once believed calm and uneventful, seethes with activity -- swelling by day and contracting by night. Affected by changes in solar activity, the upper atmosphere contributes to weather and climate on Earth. Besides affecting Earth's weather, solar activity gives rise to a dramatic visual phenomenon in our atmosphere. When charged particles from the solar wind become trapped in Earth's magnetic field, they collide with air molecules above our planet's magnetic poles. These air molecules then begin to glow and are known as the auroras or the northern and southern lights. Earth: The Movie - Animation of Clouds & Flight. 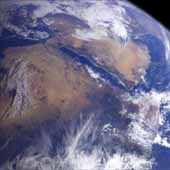 Earth: The Movie - Animation of Clouds. The following set of images show some of the wonders of our planet, the Earth. 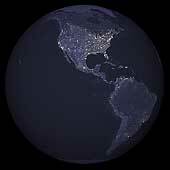 This image of North and South America city lights was created with data from the Defense Meteorological Satellite Program (DMSP) Operational Linescan System (OLS). Originally designed to view clouds by moonlight, the OLS is also used to map the locations of permanent lights on the Earth's surface. This image is a mosaic of the United States prepared by using 16 images from the Advanced Very High Resolution Radiometer (AVHRR) sensors on the meteorological satellites NOAA-8 and NOAA-9. The images were acquired between May 24, 1984 and May 14, 1986.